Pre-Hospital Event Health: Rapid Medical Intervention – Saves Lives. Colbrow Medics provides event health and medical care services including multidisciplinary Medical Assistance Teams (MATs) to high risk events where there is a possibility for patients at the event to require critical care medical service, or medical services beyond the level of first aid, such that these patients can be assessed, treated and either rapidly moved to a hospital environment for continued care, or allowed to continue enjoying the event, delaying or preventing a hospital presentation. 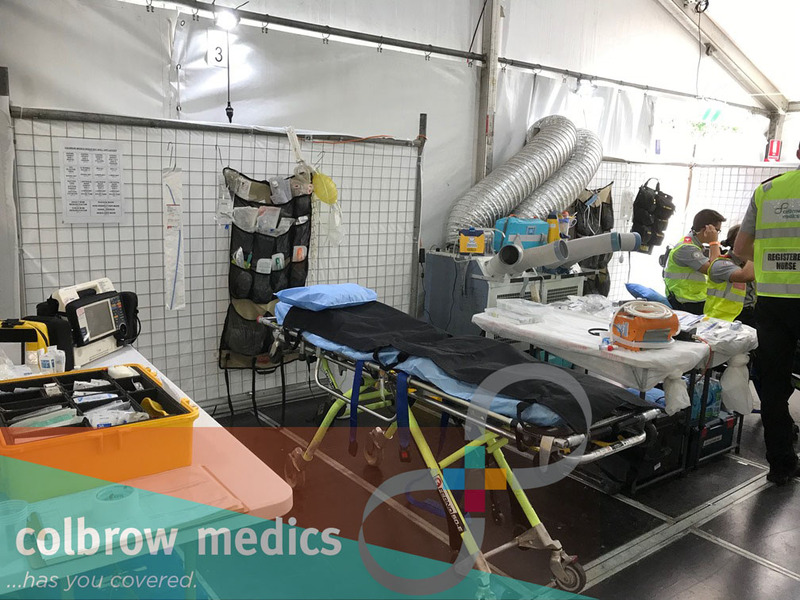 Practically, this means that people at our medical tents are able to get the kind of expert critical care they’d typically receive in a hospital ER. No waiting for an ambulance or the time to get to hospital; a high level of critical care is available on the spot. Registered Nurses who specialise in Emergency and Intensive Care nursing. They were supported at the event by a number of Paramedics and first aid level staff. An 8 bed medical centre was deployed, which included a 2 bed Resuscitation unit. 7 hours into the event, a male patron in his late 20s was carried into the resuscitation area by a number of security staff. He was confused and agitated and unable to walk on his own. pulse oximetry monitoring. He was found to be tachycardic at 130bpm, hypertensive at 160/95 and hyper-pyrexial at 40.6°C. He had normal oxygen saturations of 100% on room air and of note, his skin was pink and dry. The patient was quickly assessed as having a life threatening problem and the resuscitation crew was rapidly assembled. manual handling risk to the security staff, a big risk of falling off the stretcher due to his agitation, and a risk to the treating team due to flailing arms and an overwhelming desire to keep moving. such that he no longer needed to be physically restrained. At this point, he could have 2 intravenous lines placed (Tip: The cephalic vein is often a large calibre, superficial vessel that traverses over the anterior aspect of biceps brachii. Particularly in young, athletic males, this provides an excellent cannulation site as it is straight, away from joints, readily palpable and visible and large in size.) and a further dose of sedative (Midazolam) administered intravenously. and ketamine. This combination had led to a critical rise in core body temperature, which has the potential to cause seizures, melt body tissues and cause severe electrolyte and kidney disorders. endotracheal tube and breathe for the patient without complication. Simultaneously to this occurring, an Intensive Care Paramedic team had been arranged through the close working relationship of Colbrow Medics and Ambulance Victoria, and the receiving hospital was notified by the Colbrow Medics Doctor of the patient’s impending arrival. The patient’s vital signs had normalised by the time of their departure from the event, most importantly their temperature had fallen to 37.6°C, below the threshold of 38°C. The patient was woken and extubated about 4 hours after their arrival in hospital. Whilst there was already some evidence of muscle (including heart muscle) damage from the hyper-pyrexia, there was no evidence of brain or kidney damage. From the time of arrival to the Medical Assessment Team to the time of departure from the event was less than 1 hour, during which time the patient had been taken from a life threatening situation, to a critical but stable condition with good prospects for recovery. 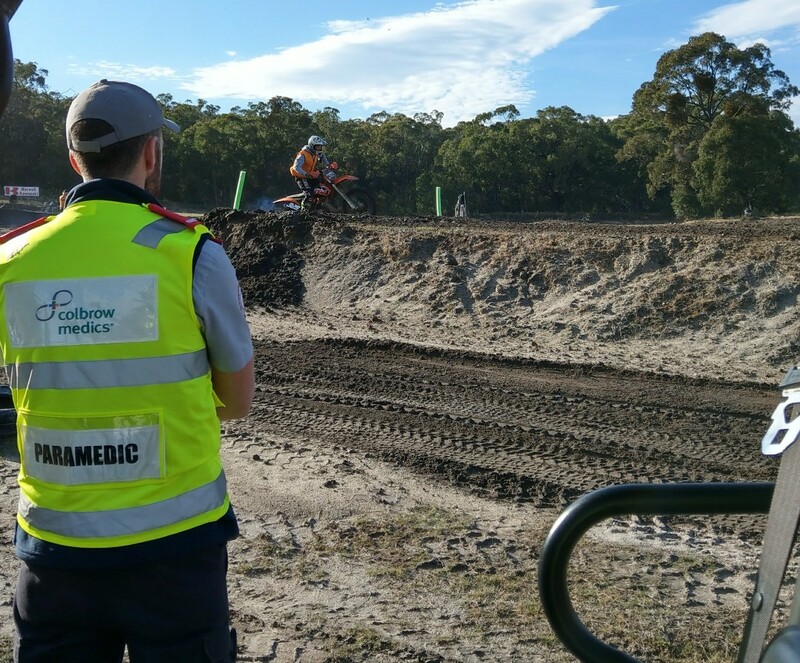 The patient stayed in hospital for about 36 hours prior to being discharged and never required Intensive Care Unit admission, thanks to the pre-hospital care he received at the event. 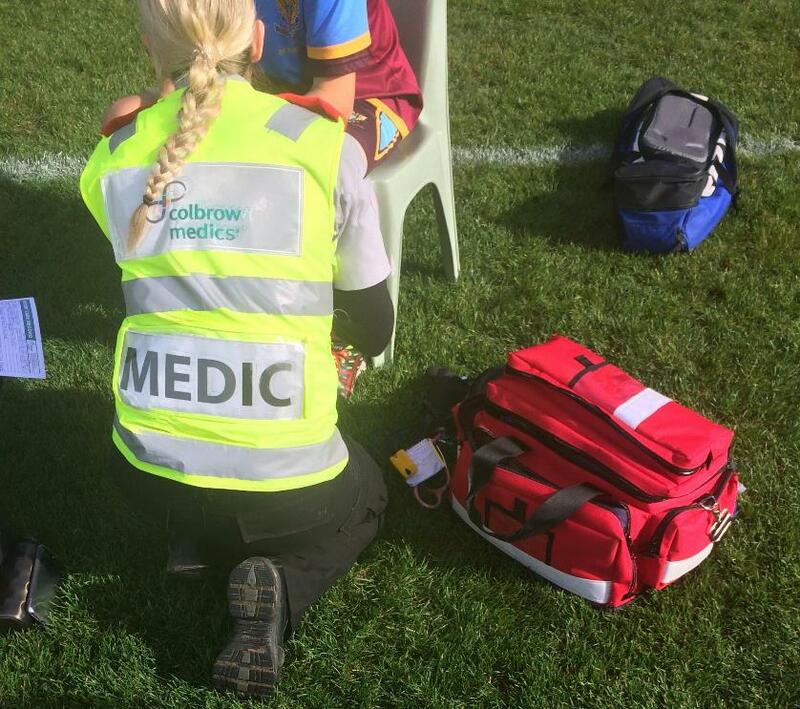 Contact Colbrow Medics to discuss how our expert medical staff can perform life saving interventions onsite at your next music event.